Kaffir Lime Information from It Rains Fishes (offsite). Check out Kasma's article on Growing Kaffir Lime Trees in the San Francisco Bay Area. also her blog entry Grow Your Own Kaffir Lime Tree. 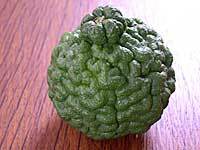 Kaffir lime (magrood): A profusely fragrant tropical citrus, kaffir lime is indispensable in Thai cooking and cannot be substituted with other kinds of citrus. The valued parts are the leaves (bai magrood) and the peel (pew magrood) or zest of the limes. The juice is also aromatic but is not generally used in cooking since its perfumy quality can overpower light sour dishes. Both leaves and peel are available frozen or dried if you are not able to find them fresh and do not grow your own. The dark green leaves come in double form – a more pointed top leaf joined to a more rounded bottom leaf. They impart not only a sweet, lemony scent but a wondrous flavor of their own to soups, salads, curries and stir-fried dishes. For watery simmered dishes, the leaves are bruised and added whole; for dry dishes, they are cut into very fine hairlike slivers. To sliver, stack a few leaves at a time and cut at a slanted angle with a sharp knife; or use scissors. The dark green limes have irregular bumpy surfaces, and in the tropics, can grow larger than the common American lime, though they usually are much smaller grown in temperate zones. Their peel is even more richly perfumed than the leaves, with an exotic flavor unlike the zest of any other citrus. Along with lemon grass and galanga, kaffir lime peel is a foundation ingredient of most Thai curries, giving a complexity of flavor that distinguishes them from Indian curries. If substituting with the dried forms, use the dried leaves like bay leaves in watery simmered dishes; for dry dishes, soak in warm water to reconstitute before slivering. The dried peel needs to be soaked to soften before chopping and pounding with a heavy mortar and pestle to reduce to paste. I find the dried peel imported from Thailand to have a richer dimension of flavor than the peel from limes grown in California. If you are not able to find the peel fresh or dried, substitute with equal parts of fresh lime zest and minced kaffir lime leaves. Because kaffir lime is such an essential Thai flavoring ingredient and both fresh leaves and lime peel are sometimes hard to find, it is worth growing your own bush. Ask your local nursery to get you one; or order directly from Four Winds Growers. If possible, start with a better-established five-gallon size. If you do not live in a frost-free area, grow it in a planter that you can wheel indoors for the winter. During the warm months, give it plenty of water, citrus fertilizer and sunshine. Prune to a bushy shape, and when established, harvest leaves in the summer to freeze for the cold months when growth slows. Sealed in a plastic bag, both leaves and limes freeze well and keep for a year or more. If you are not ambitious about making your own curry pastes, keep the bush from fruiting too heavily at the expense of leaf production. Copyright © 2000 Kasma Loha-unchit in Dancing Shrimp. All rights reserved.